The death toll in Friday's explosion in a predominantly Somali area of the Kenyan capital Nairobi has risen to five, police say. They said at least eight people were wounded by the blast, including an MP. The explosion, near a mosque in the district of Eastleigh, came two days after a bomb exploded in the same area, killing one. Kenya accuses Somalia's al-Qaeda-linked al-Shabab militant group of trying to destabilise the country. The explosion happened at around 19:30 local time (18:30 GMT). A grenade was thrown at worshippers leaving the mosque after evening prayers, police and witnesses said. Three people were initially confirmed dead but police chief Moses Nyakwama told Agence France-Presse that two later died of their wounds in hospital. "We have sent more officers on the ground to ensure there is peace," he said, after protesters had taken to the streets to express their anger over the attack. 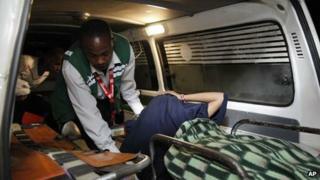 Last month, Kenya accused al-Shabab of launching a grenade attack on a bus in Eastleigh, killing seven people. Kenya last year sent its troops to fight al-Shabab in Somalia - they have now joined the 18,000-strong African Union (AU) force supporting the UN-backed government.